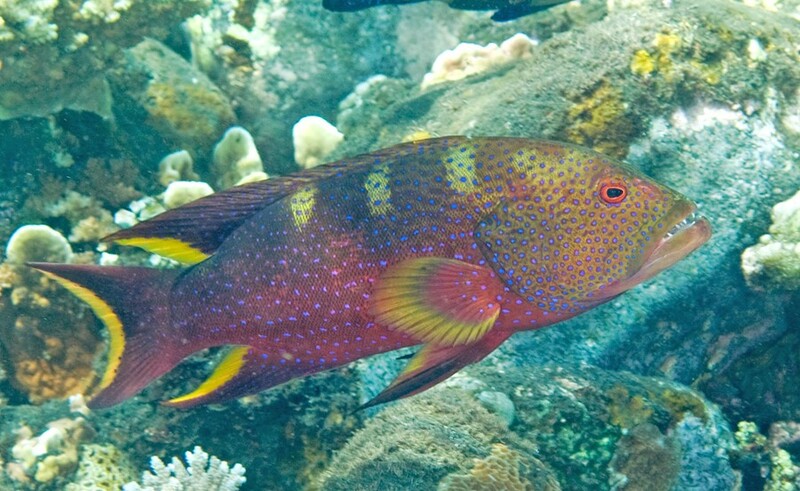 The Cherry Skunk Grouper known as the Louti Grouper or Yellow-Edged Lyretail Grouper is a very attractive specimen when mature; it has dazzling red color with light blue spots, the curved pointed tail fin has yellow edging. The Cherry Skunk Grouper are very hardy and disease resistant and capable of getting quite large. Provide plenty of live rock with ample swimming area. Will outgrow most smaller systems. Keep only one per tank. Feed a variety of meaty foods such as silversides and frozen shrimp. Try saturating food in liquid vitamins and garlic for good fish health.